Mixing business and pleasure comes with many positives—and negatives, say Lollaland founders and couple Mark and Hanna Lim. FROM CHILDHOOD SWEETHEARTS TO BUSINESS PARTNERS. Mark and Hanna Lim were childhood sweethearts before they got married. Now, they are also business partners. Work with your spouse? Some say, “No way. We’d kill each other.” Others say they would not want any other business partner than the person with whom they share their life. No matter which camp you fall into, mixing business and pleasure comes with many positives—and some negatives as well. 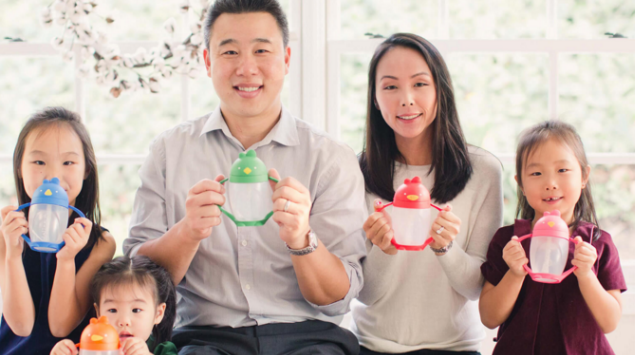 Hanna and Mark Lim are the owners of Lollaland, a line of children’s products. The couple appeared on ABC’s Shark Tank and shocked the Sharks when they said they have been a couple since they were 13 years old and still wanted to be in business together. These elementary-school sweethearts are now in their fifth year of business and said being business partners has challenged them in new ways but their relationship remains strong. Working together, they admit has its pros and cons. “When you’re husband and wife, you know intimately your partner’s priorities,” said Mark. For example, when Mark leaves work early to coach his girls’ soccer game, Hanna does not begrudge having to stay behind to finish something because they are both working toward the same goals of raising a family and running a business. Any other business partner may not be so understanding of their partner taking on family responsibilities during business hours. While Hanna was a stay-at-home mom before launching Lollaland, Mark already had experience as an entrepreneur and knew the challenges that would lie ahead if he came on board to help Hanna run the company. “I told her, you really need to think this through. We’re going to have a lot of pressure. There are going to be times when we’re going to be in full disagreement. Are you going to be able to put aside the day’s stresses when it’s time to be husband and wife or mom and dad?” recalled Mark, who said he grilled his wife for a week straight about how the business could possibly bring out the worst in them both. Although Mark and Hanna worried about the pressure working together could place on their relationship, the couple knew their relationship was strong enough to withstand any business pressures. Couples who lack this strong foundation could find the business tears the relationship apart. While many couples will celebrate each other’s successes—a new promotion, or landing a new account—Hanna said working with her life partner day in and day out toward the same goals means she celebrates her husband’s successes as though they were her own because, well, they are! “When things are stressful at work; like Mark is bugging me about whether I got that press kit done and I haven’t, it’s difficult to come home and have that not carry over when we’re running around doing baths and fixing dinner,” said Hanna. No matter how much they try to keep work stress at work, Hanna and Mark admit stress does sometimes come into their home. Couples who run businesses together have a deeper understanding of each other’s emotions, strengths, and weaknesses than business partners who do not also share a bed. “We understand each other’s signs,” said Hanna. Building the kind of synergy Hanna and Mark have takes time although Mark said, running a business together has taught them even more about each other. “I’m still learning things about Hanna and we’ve been together since we were in middle school,” he said.